Terminal customization has become a fairly big hobby for Linux users. 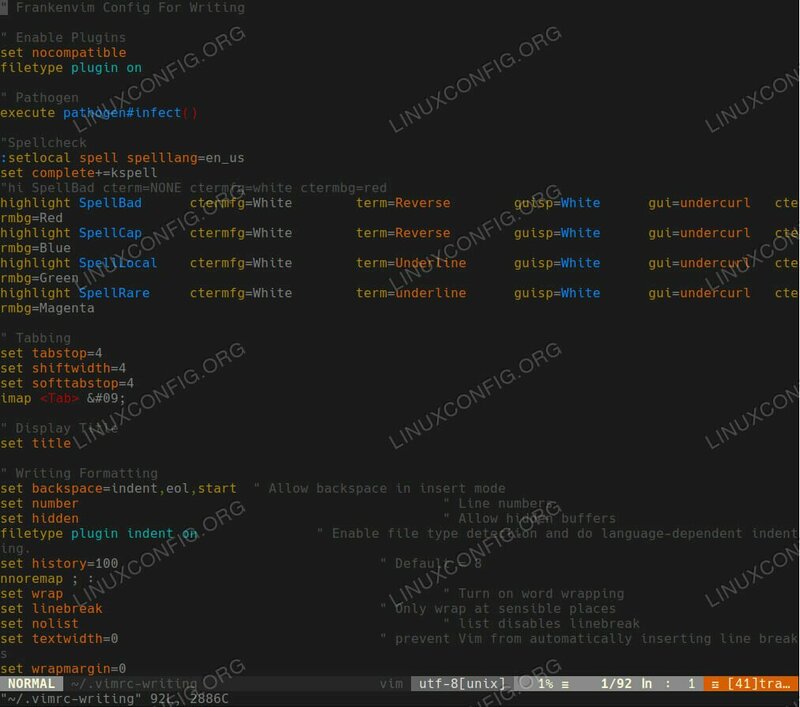 There are plenty of ways to spice up the Linux terminal and make it look modern and visually appealing. It’s not just for appearances either. A well thought out color scheme can help reduce eye strain and make working in the terminal a much more enjoyable experience. Gruvbox is, as the name suggests, a retro-inspired color scheme that makes use of high contrast colors without using any strikingly bright or oversaturated ones. 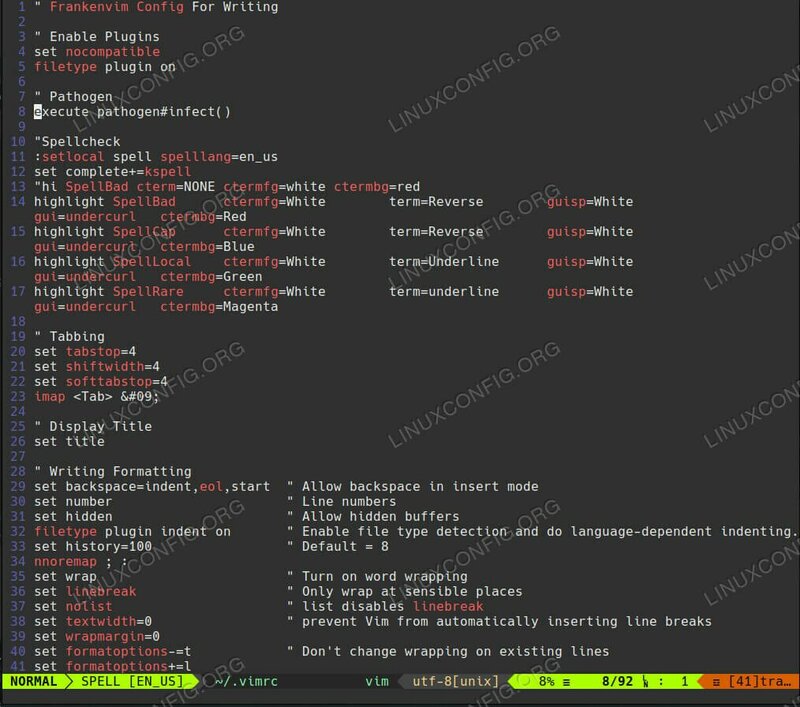 The color scheme was originally developed for Vim, but there are plenty of variations available through the contrib repository that you can use for a variety of terminal emulators and X itself. Gruvbox is fairly unique in its color choice and feels surprisingly warm compared to most other options. The Solarized color scheme has been around for a while now, and it’s still one of the most well loved among Linux users and developers alike. The entire goal of the Solarized color scheme is to reduce eye strain and create the theoretical best color scheme for you. They did the math too, carefully selecting colors based on their relation to one another for maximum contrast and variation. It also comes in both dark and light variants for day and night use. This one might be the best option for marathon terminal sessions. Dracula is a dark theme for… everything. Seriously, there’s a version of the Dracula theme for just about everything you can think of. There’s even one for Slack. Dracula makes use of a dark palette without beating you over the head with it. This isn’t some cheesy goth “everything’s black” theme. Instead, it uses darker elements to boost contrast and make your text pop. Base16 isn’t just a theme or set of themes. It’s actually a system for building themes based on syntax highlighting using sixteen colors. The Base16 guidelines allow you to choose your own theme, essentially and always get something that highlight the important parts of what you’re working on. For code, this highlighting makes everything much clearer, displaying different pieces of structure in different colors. It also makes spotting typos simpler as well. Base16 also has a ton of variants for different applications, making it an all-around fantastic option. 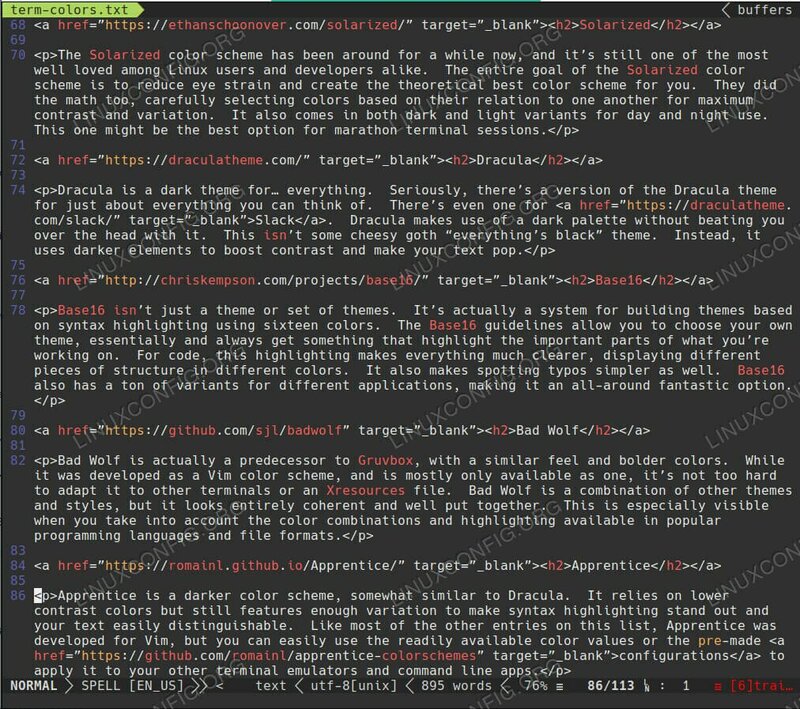 Bad Wolf Terminal Color Scheme. Bad Wolf is actually a predecessor to Gruvbox, with a similar feel and bolder colors. While it was developed as a Vim color scheme, and is mostly only available as one, it’s not too hard to adapt it to other terminals or an Xresources file. Bad Wolf is a combination of other themes and styles, but it looks entirely coherent and well put together. This is especially visible when you take into account the color combinations and highlighting available in popular programming languages and file formats. Apprentice is a darker color scheme, somewhat similar to Dracula. It relies on lower contrast colors but still features enough variation to make syntax highlighting stand out and your text easily distinguishable. 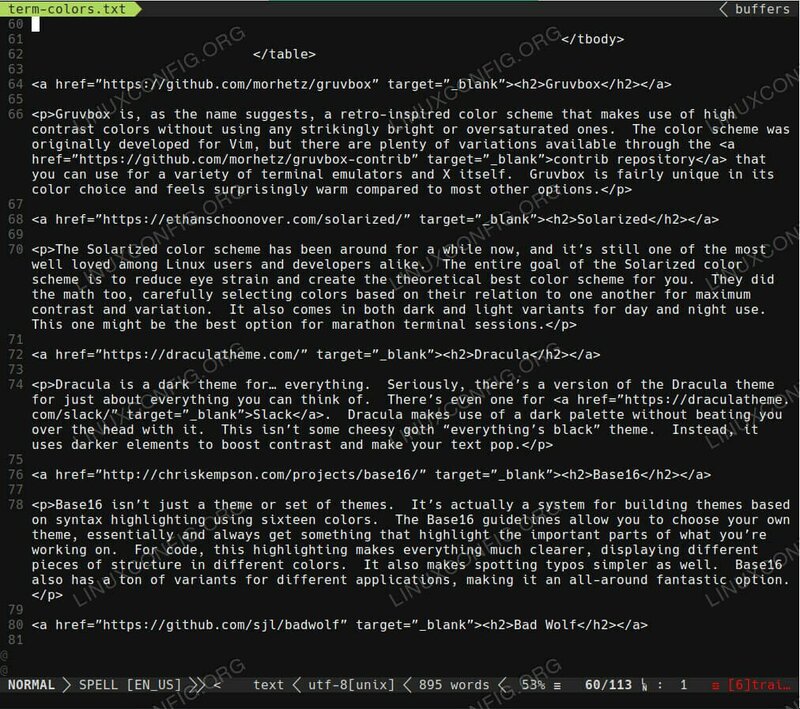 Like most of the other entries on this list, Apprentice was developed for Vim, but you can easily use the readily available color values or the pre-made configurations to apply it to your other terminal emulators and command line apps. PaperColor is somewhat different. 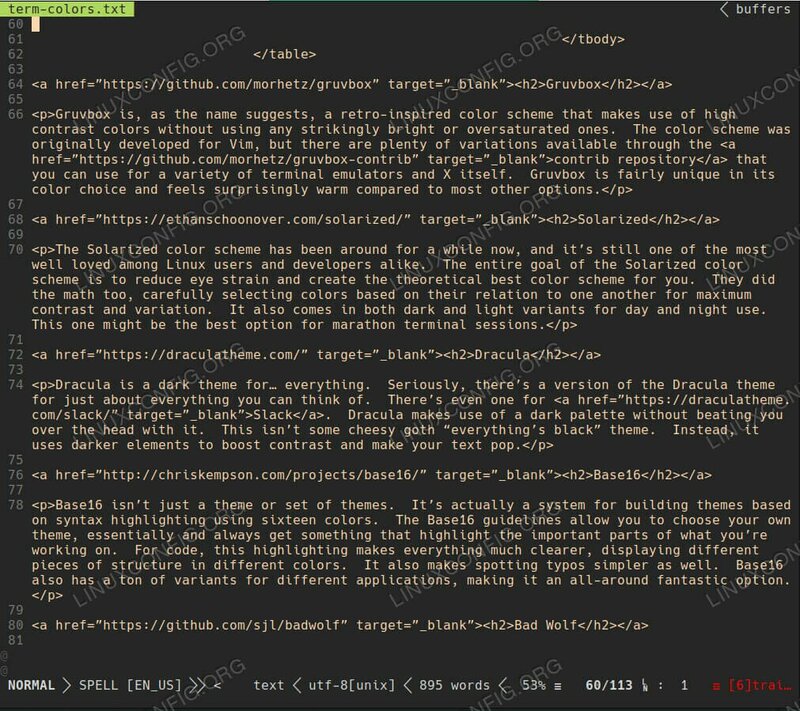 It utilizes a terminal background color that looks somewhat like paper by default, and the accompanying highlighting and text colors to bear more than a passing resemblance to various pen inks. The result is a surprisingly natural feeling terminal. 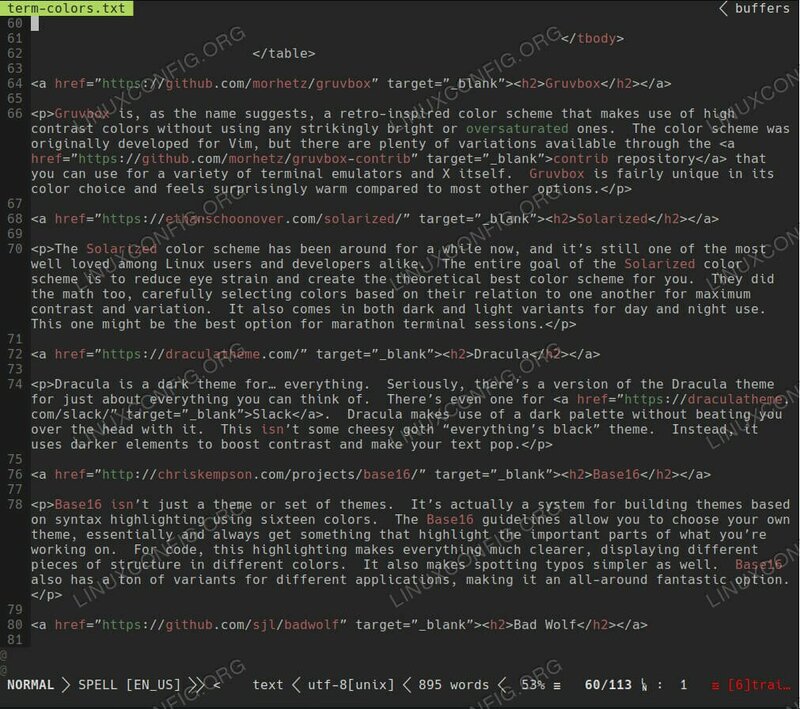 There is also a dark variant of the theme with much bolder text colors. This one is designed around Vim, but there are other variants available, and the hex values of both variants are readily available to customize your other applications. 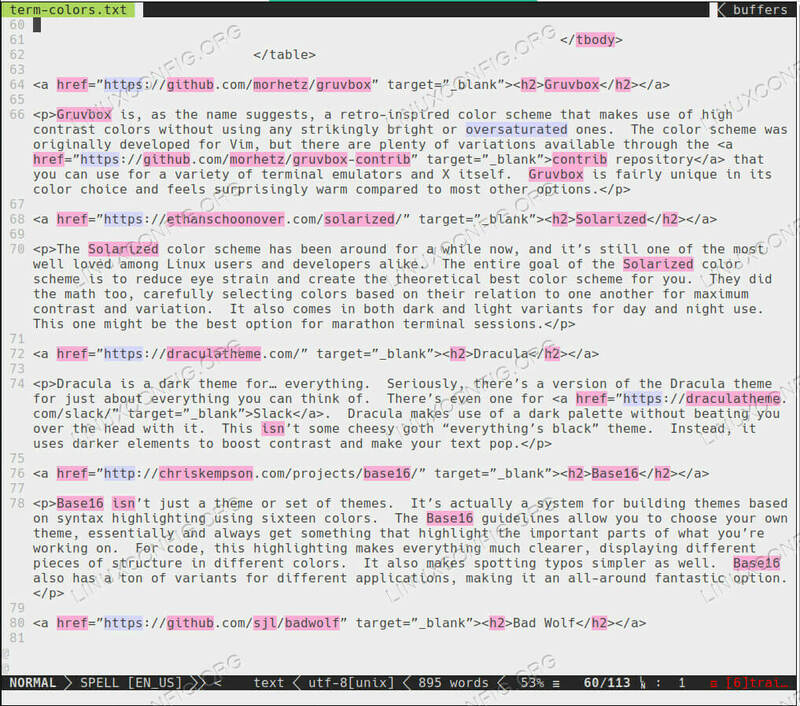 Any of these color schemes would be a fantastic addition to your terminal emulator and Vim. There’s a surprising amount of design and artistic detail that goes into developing an appealing color palette for the terminal, and all of these have excelled at it.